Scotch Magic Tape 810 12mmx66m 8101266 Pack of 2 3M Scotch Magic Tape It's invisible in use and can be written on. Ideal for paper repairs and sealing. Won't ghost on photocopies or yellow with age. Each roll measures 12mm x 66m. 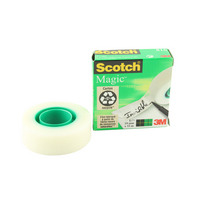 Scotch Magic Tape 810 19mmx33M Pack of 1 3M Scotch Magic Tape It's invisible in use and can be written on. Ideal for paper repairs and sealing. Won't ghost on photocopies or yellow with age. Each roll measures 19mm x 33m. Scotch Magic Tape 810 19mmx66M 8101966 Pack of 1 3M Scotch Magic Tape It's invisible in use and can be written on. Ideal for paper repairs and sealing. Won't ghost on photocopies or yellow with age. Each roll measures 19mm x 66m. Scotch Magic Tape 810 25mmx66M 8102566 Pack of 1 3M Scotch Magic Tape It's invisible in use and can be written on. Ideal for paper repairs and sealing. Won't ghost on photocopies or yellow with age. Each roll measures 25mm x 66m. 3M Photomount Adhesive 400ml Can Pack of 1 3M PhotoMount Spray Adhesive Permanent. High strength adhesive - provides an instant and permanent bond. Ideal for photographs, archiving, illustrations, prints and maps. pH neutral, non yellowing and UV resistant. Clear and non-staining. 3M Spray Mount 200ml Can Pack of 1 3M SprayMount Spray Adhesive Repositionable. Easily repositioned up to 12 hours later. Ideal for mock ups, mounting designs, theatre sets, prototyping, exhibition boards and lightweight materials. Clear and non-staining. includes 1 x 200ml spray can. 3M Spraymount Adhesive400mlSpray400 Pack of 1 3M SprayMount Spray Adhesive Repositionable. Easily repositioned up to 12 hours later. Ideal for mock ups, mounting designs, theatre sets, prototyping, exhibition boards and lightweight materials. Clear and non-staining. includes 1 x 400ml spray can. Bostik Blutack Handy Size 801103 Pack of 12 Re-usable adhesive putty. Clean, non-toxic formulation. Stays flexible and won't dry out. Suitable for non-porous surfaces, paint, glass and metal. Easily removable. 0.5 g of Blu-Tack can hold up to 105g. 1x 60g Handy Pack. Sellotape Case Seal 50mmx66M 1447026 Pack of 6 Sellotape Case Sealing Tape. Premium quality, tough, waterproof vinyl buff tape, for secure sealing of cases and packages up to18 kg. Size: 50mmx66m. Sellotape Dble Sided 15mmx5M 118 5501 Pack of 12 Sellotape double sided tape. Versatile tape coated with strong adhesive on both sides to create an instant dry adhesive bond. Easy tear and easily removable backing paper for effortless use. Ideal for display, mounting and exhibition work. Size: 15mmx5m.